Over the past few years, SoMa has been the scene of several festivals, celebrating everything from edibles (cheese dip, watermelon, tomatoes) to cultures (think Africa Day) to combining the two in the yearly Arkansas Cornbread Festival. The Cornbread Festival honors much more than the ubiquitous yet unassuming southern favorite – with lyrical live music, a variety of vendors, more cornbread and sides than most can eat, and crowd-favorite Cosmo the Cornbread Man greeting folks and posing for pictures – the festival celebrates neighborhood, neighborliness, and family. Then there’s the friendly competition and generous prizes for whomever bakes up the Best of Show – and other prize winners. 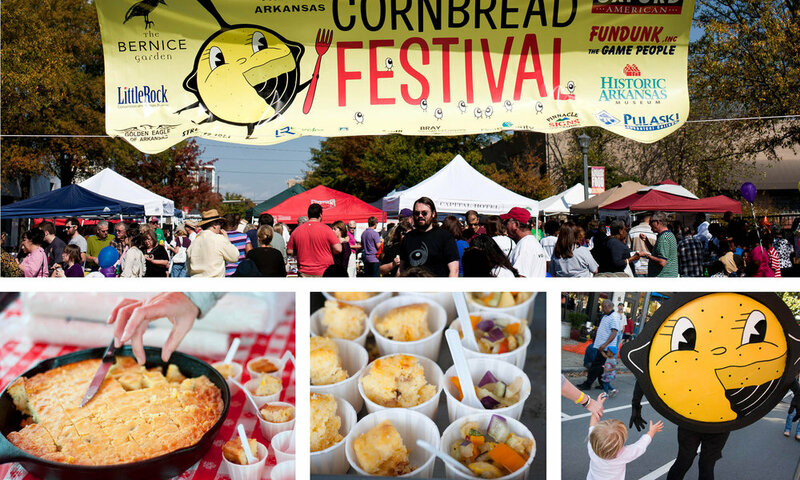 Since it’s inception in 2011, the Arkansas Cornbread Festival just keeps getting bigger and better. But one thing hasn’t changed: Get there early or you might have tears in your buttermilk. Cornbread, no matter the quantity, disappears quickly. People can’t get enough of that quintessentially Southern staple.